This photo was taken on September 10, 2006 at the famous Waverly Hills Sanatorium in Louisville, Kentucky. 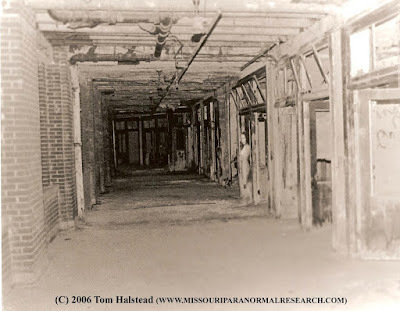 It was taken by Tom Halstead during an overnight investigation of the facility by Missouri Paranormal Research. The photo was taken on the 4th floor of the main hospital building around 7am. The camera used was a Pentax K1000 35mm film camera with a Pro-Master 5600 extendable flash. ILFORDHP5 black and white 400 ISO film was used. According to team data, the camera settings were at a 1/60 second speed and F-stop of 5.6. As one can pretty plainly see, on the right of the frame there appears to be the apparition of a young woman with dark hair and a white nightgown or dress. But who is this woman? With the death toll well into the thousands, there seems like there could be a never-ending pool of potential suspects. But, a few theories have prevailed. She is commonly believed to be a young girl named Mary Lee, based on a photograph that was found of a similar looking girl signed, "Love, Mary Lee" on the back. But who was Mary Lee? One website claims that SHE is the legendary nurse who allegedly hung herself in room 502 after either learning that she was pregnant by a doctor or had TB or both. Others say that Mary Lee was the daughter of a doctor who often visited the patients and tried to cheer them up. Unfortunately, she herself contracted TB and passed away. And others just simply believe she was one of many of the patients who lived and died in the facility over the years.